The cost to participate in the MXON is significant and funding is tight. To ensure that we can continue to enter a competitive team some fund raising has been established by Mark Luksich and Motorcycling Australia, who has been involved with the event for many years. The fund raising includes two very special rider training clinics along with some auctions and other activities. All funds go to the team expenses and allow Team Oz compete against the best in the world. Lets get behind the effort and help make sure that we send the best team to the USA this year to try to get a great result for the green and gold!!! 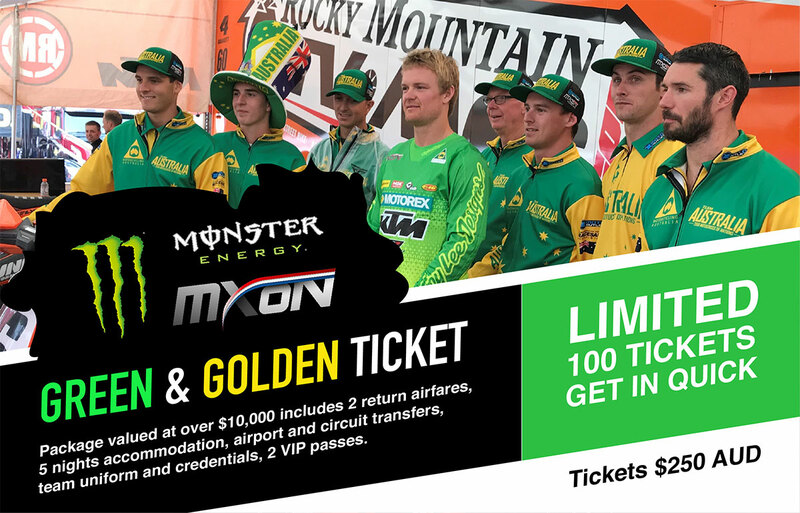 All profits raised by our Events & Competition are 100% allocated to the Australian MXoN Team. The funds are managed by Motorcycling Australia and go towards travel, accomodation, freight and all the costs of getting to the event. Let’s get our boys to the MXoN! Australia first entered the MXoN in 1984 where riders Stephen Gall, Trevor Williams, David Armstrong and Vaughan Style shot off to Sweden to give it a crack with very little experience and budget. Since then Australia has always fielded a team with the likes of Craig Dack, Glen Bell and Jeff Leisk cracking a 4th place in France in 1988 to more recently with Chad Reed, Brett Metcalfe and Matt Moss finally grabbing Team Oz a 3rd place podium finish in 2011.